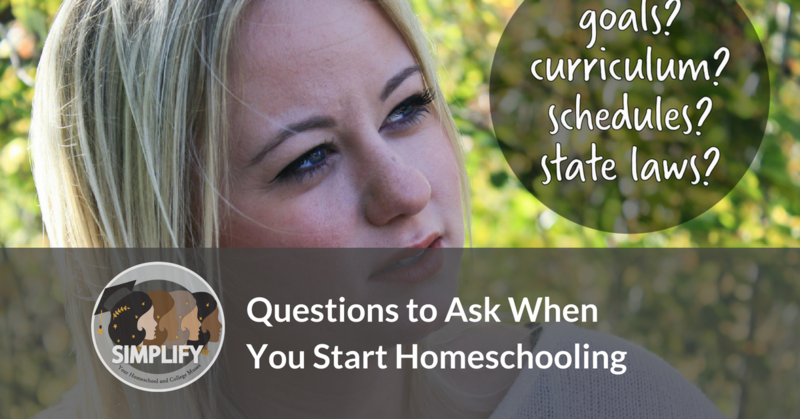 One thing I’ve noticed through talking with new homeschoolers over the years is that many families don’t even know what questions to consider or ask when they start out. It’s common for a family to start homeschooling because of changed circumstances, so it makes sense that not everyone would have a secret homeschooling vision board ready to go. Of course, families aren’t always even sure what the questions are, much less the answers. This is hardly an exhaustive list of questions. Some families are more focused on practicalities, while others are trying to make big philosophical decisions. That’s okay. You don’t need to have answers to all of these in order to homeschool. But sometimes even knowing what questions to reject or that you have easy answers for can be useful in getting focused. What is the goal of education? Some people dive into the nitty-gritty questions without ever considering their philosophy in the first place. You don’t have to have a well-developed sense of what the point of education is, though some people find it useful to write out a mission statement or a philosophy of education statement. Spending just a little time considering this can really help you answer those nitty-gritty questions later on. If you’re deciding between different approaches or programs, going back to your goals can make it crystal clear what choice to make. If you’re struggling to understand if your child has succeeded, then defining success can be essential to answering that question. What’s the goal of this subject? Beyond having a sense of the overarching meaning of what you’re doing, you may want to have a sense of the point of individual subjects or the best approach to them. Some questions, such as the best approach to teaching a young child to read, are well-trod debates in the education world and specific programs reflect specific philosophies. You can start more basic and just ask yourself, why am I teaching these subjects and what do I hope my children get out of them? What is the goal of our time homeschooling? Your homeschool goals may be the same as your goal’s for a child’s overall education. However, they may be more specific, such as to remediate a specific skill, work on your child’s emotional or physical health, or prepare for a specific next step. Alternately, you may want to focus on interest-led or outside the box learning while a student has a break from the traditional classroom. How will my child learn best? There’s no scientific evidence to back up the idea that students have easily classifiable “learning styles.” However, thinking about what sort of approaches will work best for your student is important. Customizing things to your child’s strengths and interests is one of the biggest benefits to homeschooling. How much input should my children have in their education? There are lots of ways that children can have input into the method, the materials, the assignments, or the topics in your homeschool. Think about whether your child’s input and interests are an important component of education for you and what that might look like. Do my children need a break? New homeschoolers are often excited to get started as soon as possible. However, sometimes students coming out of the school system need a break or something to shake things up before diving back into serious learning. Think about your child’s emotional and mental health. Would you benefit from making sure you take time to stop and reflect before getting started? What do I want our days to look like? Before you sit down and plan an actual schedule or routine with real programs, think about what you picture homeschooling to be like. What is your dream day? What sort of things does it include? What is your child doing and learning about? Go back to this question when you think about actually setting up a homeschool day. Does it fit with your vision? Is it okay if it doesn’t? How important is it for us to “keep up with” the public schools? A lot of new homeschoolers have a knee-jerk assumption that they must keep up with public schools. A lot of old time homeschoolers have a knee-jerk assumption that trying to do what public schools do is bad. Remember that content varies wildly from state to state, making subjects like science and social studies very flexible, but that skills expectations are slightly more standardized. If you know a child is headed back to the classroom, it can be important to consider. Do I want an all-in-one homeschool curriculum or do I want to put things together myself? Some homeschool programs cover every subject (or every subject except math and electives). Other programs are made for specific subjects and you can even make your own program. There are benefits and drawbacks to doing it both ways. For example, all-in-one programs make customizing a child’s level and interests a lot harder and can be more expensive. However, they provide a single schedule that a DIY approach won’t give you. Truly making your own programs is also an option, one that doesn’t have to be as difficult as some believe. What programs are out there? Sometimes the most nuts and bolts piece is the hardest for people to get to and then, at the last minute, there’s a sense of panic when you realize that you don’t know what options are available to your child to help bring about the vision you have. Homeschool programs advertise and there are catalogs of materials. However, it can take research because there’s no comprehensive list. How will my child and I communicate about assignments and feedback? Giving assignments and feedback doesn’t have to be complex, but many families like having a system, such as a student planner, a white board on the wall, or in boxes and out boxes. Some families make specific times for feedback while others give feedback in the moment, making sure they’re available right away. Think about what makes sense for you students. How independent can my child be? A lot of parents make assumptions about this without really considering the question. Some students are ready to be independent at a young age while others need a lot more support well into the teen years. Students in schools are often not as independent as parents assume. What will our schedule and days look like? Many homeschoolers will tell you that no two days look alike in their homeschools. However, most families have a general sense of rhythm and routine if not a timed schedule. Figure out if schedules or routines will work better for you. Think about when “school” will happen in your home. You can think outside the box. School may not take that long in the early grades. Consider your child’s individual sleep needs and extracurricular schedule. What are the different biases of materials I might see? This is a question that people really new to homeschooling almost never know to ask. Because people of all different backgrounds homeschool, there are homeschool materials geared specifically toward different groups. Many homeschool materials may have a religious perspective that you don’t agree with, and it may not be advertised very clearly. What are my state or provincial laws? Some new homeschoolers get overly focused on this question. Homeschool laws are typically very easy to fulfill, even in states that have more regulation. Do find out the answer to this question, but don’t let it overly influence your planning. Homeschoolers in your area or your statewide group, if you have one, are usually the best places to get answers. Need help answering more questions? Reach out to Simplify anytime! Previous StoryCollege Was So Much Cheaper in My Day!